Wave motion is the transport of energy from one point in space to another without the transport of matter. In mechanical waves, such as water waves, waves on a string, or sound waves, energy is transported by a disturbance that is propagated through a medium because the medium has elastic properties. However, in electromagnetic waves, the energy is carried by electric and magnetic fields, which can propagate through a vacuum as well as a medium (such as copper wire). When any electric particle oscillates, it produces both an electric and a magnetic field. The two fields are coupled together. They are perpendicular to each other and travel together as one wave. See the illustration at the left. All electromagnetic waves travel at the speed of light in a vacuum. 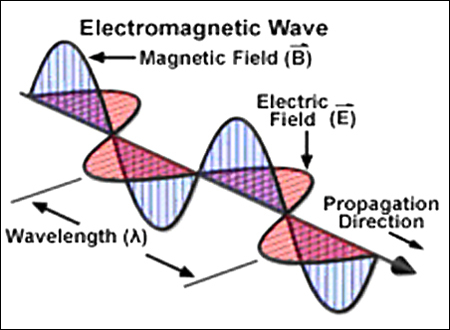 Electromagnetic radiation is a repeating periodic wave. The number of repetitions per second of the waveform is called the frequency and is measured in Hertz (Hz). The wavelength, Lambda (λ), is the distance a wave travels during one complete cycle. Lambda is usually measured in meters. 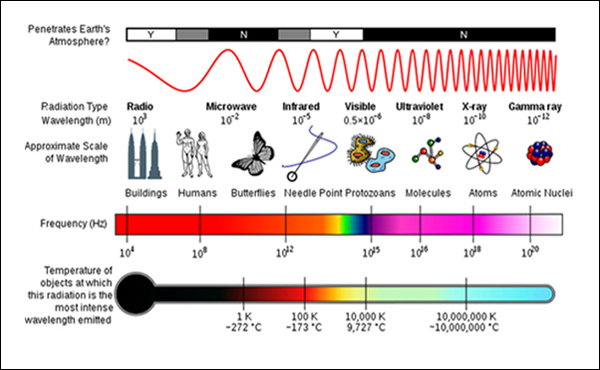 All matter emits electromagnetic radiation when it has a temperature above absolute zero. The radiation is a conversion of a body's thermal energy into electromagnetic energy, and is called "thermal" radiation. All matter also absorbs to some degree the electromagnetic radiation that falls on it. An object that absorbs all the radiation falling on it at all wavelengths, i.e. it reflects nothing whatsoever, is called a black body. 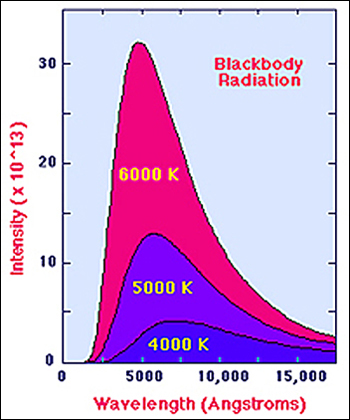 When a black body is at a uniform temperature, its emission has a "characteristic frequency" distribution that depends only on the temperature. Its emission is called blackbody radiation. See the examples in the chart at the left. 6000 K is approximately the temperature of the surface of the sun which has a radiation spectrum like the one in the chart. By carefully plotting the radiation curve of the sun, scientists were able to fit a curve to the data, and then predict the temperature of the sun's surface, which is 5800 K.
The concept of a black body is a theoretical idealization, as perfect black bodies do not exist in nature. However materials, like graphite and lamp black, that absorb radiation greater than 95% of the ideal are good approximations. A black body absorbs all incident electromagnetic radiation. Because of this perfect absorption at all wavelengths, a black body is also the best possible emitter of thermal radiation. Using an optical telescope, the background between stars is completely dark. But a very sensitive radio telescope shows a faint background radiation almost exactly the same everywhere - between stars all over the universe as well as here on earth. 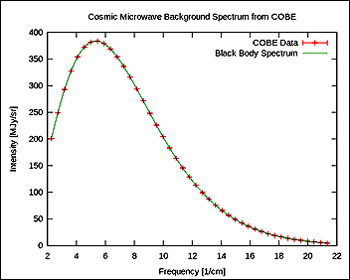 This radiation, called the Cosmic Microwave Background (CMB), is strongest in the microwave region, see the complete electromagnetic spectrum above. The original Big Bang radiation was very strong Gamma Rays with extremely high temperatures and frequencies. The current CMB radiation has been traveling incredible lengths, has cooled almost to zero, and has red shifted from very high frequencies to relatively low frequencies. As explained above, the current CMB radiation has expanded from a point source 13.75 million years ago to the whole observable universe today. 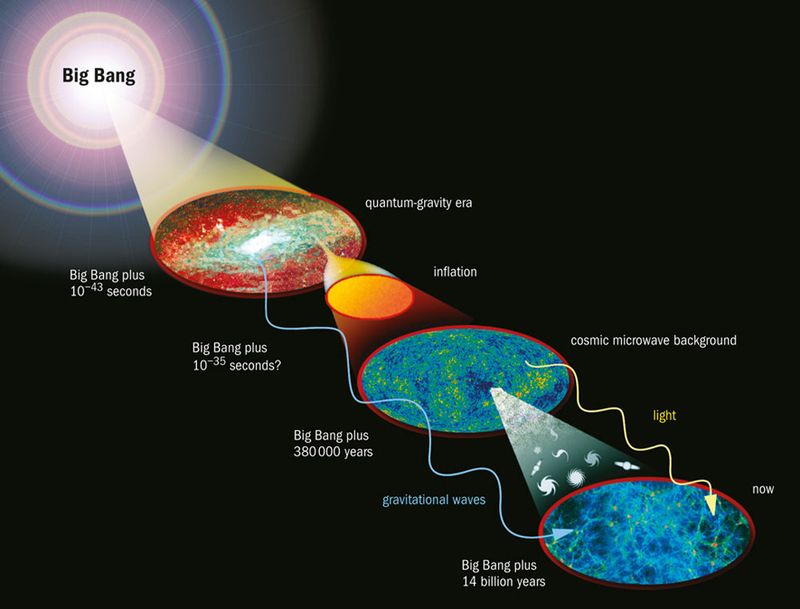 The CMB was predicted in 1948 from theoretical Big Bang equations by George Gamow, Ralph Alpher, and Robert Herman. Alpher and Herman were also able to estimate the temperature of the CMB to be 5 degrees Kelvin (5 K). This prediction was largely ignored by the majority of the scientific community, who at that time were not intrigued by Cosmology - the study of the universe as a whole. In 1965, Arno Penzias and Robert Woodrow Wilson at the Bell Telephone Laboratories in New Jersey built a very sensitive radiometer that they intended to use for radio astronomy. Their instrument initially had an excess 3.5 K background temperature which they could not account for. They subsequently determined that the unknown temperature was indeed due to the Cosmic Microwave Background radiation. Penzias and Wilson received the 1978 Nobel Prize in Physics for the CMB discovery. 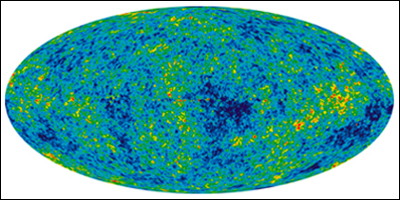 The interpretation of the source of the CMB was a controversial issue in the 1960's with some proponents of the Steady State Theory arguing that the microwave background was the result of scattered starlight from distant galaxies. During the 1970's consensus was reached that the CMB must be a remnant of the Big Bang because new more detailed measurements showed that the CMB spectrum was a thermal black body spectrum, whose origin the Steady State Theory was unable to explain. The COBE satellite did a lot more than just confirm the CMB spectrum. It created the first map of the very early universe by measuring the small density fluctuations of the CMB using very sensitive microwave radiometers and scanning the whole sky. In principle 46.5 billion light years is the furthest we can ever "see" in any direction, the "observable universe", and such a map would result result in a 3 dimensional sphere. See the illustration at the left with the earth at the center of the observable universe. 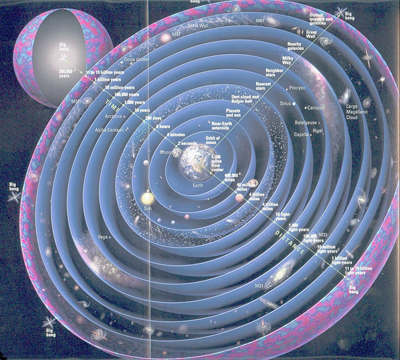 However, it is a standard cosmology technique to show the resultant map in 2 dimensions like the map of the world flattened out at the left below. 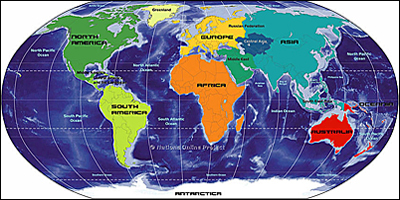 If you can imagine taking the right and left ends of the map and wrapping them in a circle, you are back to a sphere. This is how the maps of the universe are presented. The CMB density fluctuations are miniscule, on the order of 1 part in 100,000. The original CMB map took two years to compose and became very famous when announced (the second red and blue map shown at the left below). The red areas will eventually be empty space while the blue areas will become galaxy clusters. The blue areas relate to early formed gravitational fields and are the seeds of clusters of galaxies that will eventually stretch many millions of light years. The light red line across the middle of the map indicates our own galaxy. 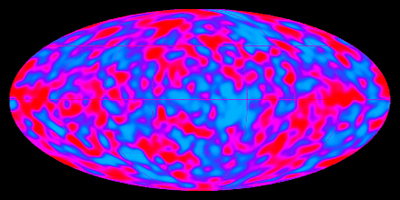 The CMB map was a huge supporter of the Big Bang Theory and Steven Hawking called it "the discovery of the century". For the CMB map and the CMB spectrum (all data gathered by the COBE satellite), John Mather of NASA Goddard and George Smoot of the University of California Berkeley received the Nobel Prize in Physics in 2006 for the design of the instrumentation and leadership of the COBE Project. The CMB measurements by COBE approached the limits of its technology. The chart did not answer all the questions cosmologists had. It probably ended up asking more questions than it answered. But... just viewing the earliest viewable universe for the first time was a huge achievement for mankind! 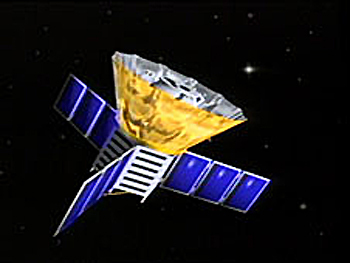 In June 2001, twelve years after COBE, NASA launched a second CMB satellite. Called the WMAP (Wilkinson Microwave Anisotropy Probe), it was designed to make much more precise measurements of the density variations of the CMB, now called anisotropies (anis-ot'-ropies). Anisotropy is the property of being directionally dependent, as opposed to isotropy, which implies identical properties in all directions. (Wood is an anisotropic material because it is easier to split along its grain than against it.) The result was a much more detailed map (shown at the left below) created from seven years of data. Note that the colors are reversed from the first map, dark blue areas are "cold spots" and the yellow and red areas are hot plasma gases in the process of forming early galaxies. As one can visually see, WMAP was significantly more technically sophisticated. 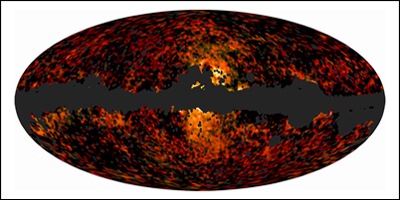 WMAP produced the first fine-resolution (0.2 degree) full-sky microwave map of the CMB radiation. WMAP definitively determined the age of the universe to be 13.75 billion years old to within 1% (0.12 billion years). The WMAP data predicts that ordinary atoms and materials (called baryons) make up only 4.6% of the universe (to within 0.1%). That "dark matter" (not made up of atoms) makes up 23.3% (to within 1.3%). And, that "dark energy" makes up 72.1% of the universe (to within 1.5%). 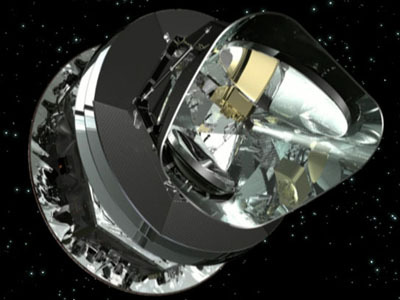 The WMAP team reported the first direct detection of pre-stellar (pre-star) helium, providing much support for the Big Bang and Inflation Theories. The Planck satellite (shown at the left), was launched in May of 2009 by the European Space Agency (ESA). It has extremely sensitive instruments that can map the Cosmic Microwave Background radiation with great precision. By February 2010 Planck had successfully completed an all sky survey and had started on a second one. In total, five all sky surveys were completed. Preliminary data from these surveys was released and results indicate that the data quality is excellent. Most Planck measurements will be limited by how well miscellaneous foreground matter can be subtracted, rather than by the detector performance or length of the mission. Foreground matter interferes with the early CMB data which is in the background. The spacecraft carries two major instruments; the Low Frequency Instrument (LFI) and the High Frequency Instrument (HFI). Both instruments can detect both the intensity and polarization of photons. Together the instruments cover a frequency range of 30 to 857 GHz. The High Frequency Instrument (HFI) completed its survey of the CMB and ran out of coolant in January 2012 lasting 30 months, which was twice its expected life. By that date, Planck had completed five full scans of the CMB. The LFI, which does not have to be cooled as low as the HFI, is expected to operate into 2013. ESA researchers spent two years carrying out a full scientific analysis of their data.. In the new results, pictured at the left, cosmologists have used 15 months' worth of Planck data. Planck represents an advance over WMAP in several respects. It has higher resolution by a factor of 3, allowing it to probe the spectrum of the CMB on a much smaller scale. It has a higher density sensitivity by a factor of 10 and it observes 9 frequency bands rather than 5. Planck revealed that the universe is some 80 million years older than previously thought, putting the age of the universe at 13.8 billion years old. Planck scientists also say there is no evidence from the data of a fourth type of neutrino which had been hinted at by NASA's WMAP. The Planck "Haze" - What Is It? Pavel Naselsky, professor of cosmology at the Niels Bohr Institute at the University of Copenhagen explains the "haze". “The Planck Satellite has observed a very unique radiation from the center of the Milky Way. By using different methods to separate the signal into a very broad range of wavelengths, the Planck team has been able to determine its spectrum. It has simply not been possible to observe this radiation in such detail before, as previous instruments have not been sensitive enough. But with Planck, this unusual radiation is seen very clearly." The yellow-cream zone in the center of the map at the left is the abnormal haze originally signaled by WMAP. This haze is enormous, a height of about 50,000 light years, much more than can be explained by a Ia supernova. Some scientists have speculated that it might be caused by Dark Matter. Australia's CSIRO's 64 meter Parkes radio telescope has detected and mapped monster outflows of charged particles from the center of our Milky Way stretching more than halfway across the sky, shown at the left. The outflows were studied by astronomers from Australia, the USA, Italy and The Netherlands. These outflows contain an extraordinary amount of energy - about a million times the energy of an exploding supernova, but the outflows pose no danger to earth. The outflows correspond to a "haze" of microwave emission previously spotted by WMAP and Planck space telescopes. Regions of gamma-ray emission were also detected by NASA's Fermi space telescope in 2010 and were dubbed the "Fermi Bubbles". The WMAP, Planck and Fermi observations do not provide enough scientific evidence to definitively identify the source of the radiation. The recent Australian Parkes Radio Telescope study suggests outflows are driven by many generations of stars forming and exploding in the Galactic Center of our Milky Way over the last hundred million years. The key to this determination was to measure the polarization of the magnetic fields, a key property of the outflow radio waves. The huge outflows from the Galactic Centre are carrying off not just gas and high energy electrons, but also strong magnetic fields. Inflation, which is generally accepted as the beginning of the Big Bang Theory, was a period of extremely rapid expansion of the universe prior to the more gradual Big Bang expansion which followed. Inflation increased the size of the "observable" universe by a factor of about 10^70 in only a tiny fraction of a second. See the Inflation Section. All this was just theory until March of 2014. Researchers from the BICEP (Background Imaging of Cosmic Extragalactic Polarization) collaboration announced the first direct evidence for cosmic inflation. Their data also presents the first images of gravitational waves, tiny ripples in space-time. Gravitational waves are small ripples in the fabric of space-time that Einstein predicted. Gravitational waves are disturbances in space-time caused by large motions of matter (such as the universe rapidly expanding in a 10^-32 second of time). They are minuscule ripples in the fabric of the universe that carry energy across space, somewhat similar to waves crossing an ocean. Propagating at (or near) the speed of light, gravitational waves do not travel "through" space-time as such, the fabric of space-time itself is "oscillating" as in the animation above. Though gravitational waves pass straight through matter, their strength weakens in proportion to the distance they travel from the source. A gravitational wave arriving on earth will alternately "stretch and shrink distances", but on an incredibly small scale. Gravitational waves are believed to be about one thousandth the diameter of a proton. Since the cosmic microwave background is a form of light, it exhibits all the properties of light, including polarization. On earth, sunlight becomes polarized by passing through the atmosphere, which is why polarized sunglasses help reduce sun glare. In outer space, the early Cosmic Microwave Background (CMB) was scattered by dense atoms and electrons and became polarized too. Inflation gravitational waves made their imprint on the cosmic microwave background that can be seen today. As a result of this imprint, there are patches of sky in which the CMB’s polarization goes one way, and other patches in which the polarization goes the opposite way. The Harvard-Smithsonian Center for Astrophysics (CfA) team using the BICEP2 telescope has constructed a very detailed map of the polarization of the CMB in a small patch of the southern sky. See the image to the left. The yellow areas correspond to one direction of polarization and the red areas correspond to another direction of polarization. It is the width and the number of the swirling yellow and red patterns (called "B mode polarization") that relates to inflationary theory. The theory predicts that if inflation happened and if it produced large-scale gravitational waves, the number and widths of the yellow and red swirls that have been detected by the CfA team, should correspond to the predictions of the theory of inflation and "they do". The imprint is much heavier than expected. "This has been like looking for a needle in a haystack, but instead we found a crowbar," said co-leader Clem Pryke of the University of Minnesota. The BICEP2 scope has an aperture slightly less than 12 inches, but it does not need to be big. Cooled to 4 Kelvin, it gazes at a 20° patch of sky 24/7, detecting the CMB’s faint microwaves and, crucially, how they’re polarized. See the South Pole photo of the BICEP2 telescope to the left. This was a three year effort because the majority of time was spent by the scientists involved proving to themselves that the polarizations were not due to extraneous factors or errors. The observations were done at the South Pole to take advantage of its cold, dry, stable air. 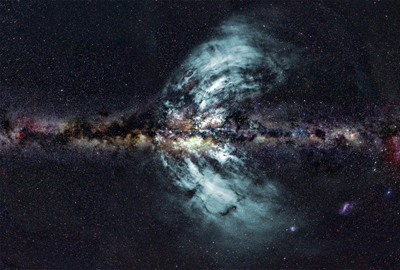 The BICEP team considered whether dust in the Milky Way could have produced the observed pattern, but the data suggest that this was highly unlikely. They also looked at the possibility of the polarization being generated by Gravitational Lensing. However, the primordial gravity waves can be separated because they have large angular scales. Gravitational lensing B modes exist at an angular scale only one-tenth that of the primordial ones and therefore can be extracted from the data. After ruling out more than a dozen alternate explanations, the team is confident that they have recorded the imprint of inflation in the sky. In statistical terms, their signal is better than 5 sigma, which is the gold standard a detection has to meet before physicists accept it as a discovery. Another important part of the discovery: this was the first time that quantum properties of gravity have been directly observed providing a link from quantum mechanics theory to gravity theory. This is the first hard evidence that gravity itself is "quantized", meaning it comes in discrete packets as light does. The gravitational waves that produced the B modes were born as quantum fluctuations in gravity itself. Quantum theory implies that on an extremely tiny microscopic scale, everything is in a state of constant agitation, including gravity. See the "quantum-gravity era" in the illustration below. These extremely tiny gravitational fluctuations then got stretched by inflation and subsequent universe expansion into humongous waves billions of light years across, that can now be "seen" with very powerful telescopes. “I think this is the only observational evidence that we have that actually shows that gravity is quantized,” says cosmologist Ken Olum of Tufts University. What could be the driving force of such an extreme expansion such as cosmic inflation? An expansion in spatial scale of 10^26 in 10^-32 of a second is not like any known energy source. There is a wealth of theoretical possibilities on the topic, but nobody really knows. However, with the discovery of dark energy, that has been proven to accelerate the universe's current expansion, the Big Bang Theory of Inflation now sounds less like theoretical speculation and more like something that can be believed. The results do not tell us anything about what occurred before the Big Bang Inflation, only that it happened. They also do not answer the question of whether inflation is "eternal", setting off an endless series of big bangs creating many universes. This cosmological train of thought is referred to as the "multiverse" scenario. See the Branes And Multiverse section. Cosmologists have always known that clouds of dust spewed from exploding stars can mimic the signature of gravitational waves. Space dust is heated up by starlight but re-emits the radiation as infra-red light. This light gets twisted because dust particles align themselves with the huge magnetic field that stretches through the plane of the Milky Way. The Planck team’s results do not rule out the BICEP2 findings, but makes clear how much dust has to be accounted for. 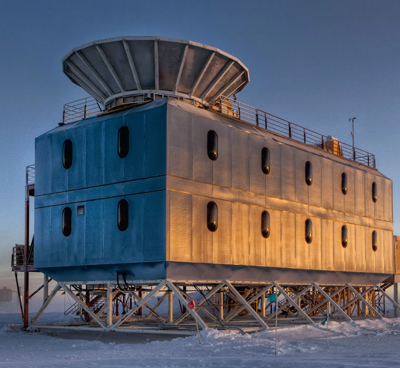 Andrew Pontzen, an independent cosmologist at University Cambridge London, said the Planck paper added to the weight of evidence that seemed to be going against the BICEP2 result. “A fair-minded person would now say that the prevailing wind is against BICEP2. Their result is not completely dead though. What you can say for sure is that the original analysis was insufficient to say the signal is really there. It doesn’t mean for sure that they haven’t seen anything,” said Pontzen. The discovery of the Cosmic Microwave Background (CMB) in the 1960's convinced most astronomers that the Big Bang Theory had merit and is now almost universally accepted as the theory that best explains the birth of the universe. 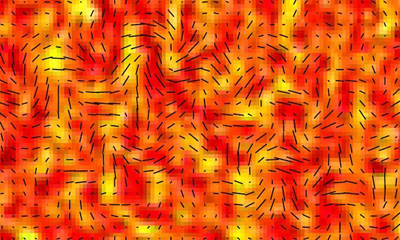 The "Cosmic Microwave Background" itself is now one of three pieces of strong evidence that support the Big Bang Theory. The other two are the Hubble Expansion, and the Big Bang Nucleosynthesis. The CMB Polarization may or may not be the fourth, stay tuned. For a great description of the the universe, see the Video by NASA's Dr. John Mather, winner of the Nobel Prize in Physics in 2006 for the confirmation of the CMB.